Checking in to Hotel Van Zandt feels unmistakably Austin (you're handed a can of beer at front desk to start). 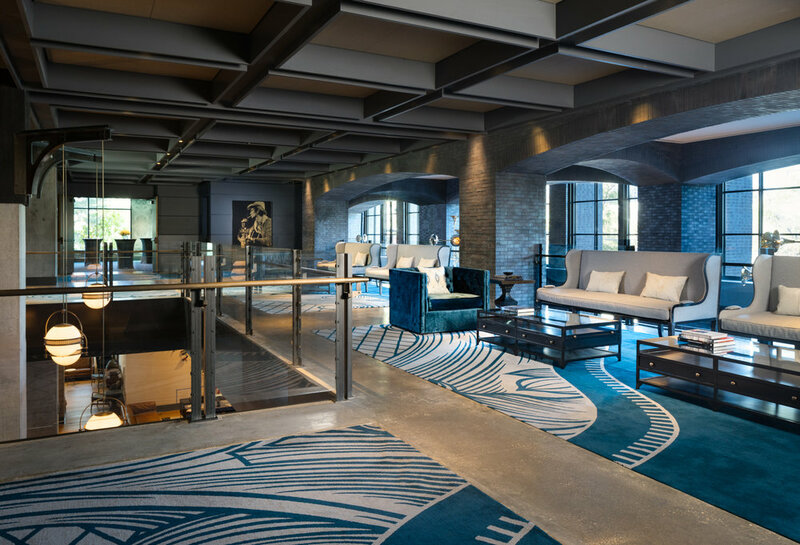 Designed as an homage to two Austin personalities, Texas diplomat Isaac Van Zandt and his great-grandson, singer-songwriter Townes Van Zandt, Hotel Van Zandt has focused on the details to create a space that is refined yet Texan. Birds made of vinyl garnish the lobby walls, record collections sit proudly next to low, sunken tan leather couches and there's a jaw-dropping brassy trumpet chandelier hanging over concierge. Located right on Rainey Street's doorstep, Hotel Van Zandt is only a short stroll to Austin's hippest food, bar and music scene. Here you can graze on food truck delicacies, grab a local craft beer and listen to jazz from up and coming artists. You're also a short cab ride from music hub 6th Street and shopping heaven South Congress Avenue. Rooms reflect Austin's chill vibe with decor and furnishings in ocean blues and cool greys. Beds are plush and views look over Austin's glimmering city. Room service is 24/7, which in a city that thrives on it's music scene is much needed. There's a rooftop pool (with an underwater sound system - very Austin), which is the perfect spot to catch sunset and adjacent is Geraldine's, the hotel's restaurant and in-house music venue. As part of the Kimpton Hotel collection, Hotel Van Zandt is pet-friendly (no added fees or size restrictions) and hosts Kimpton's wine hour every day. Staff wear denim and have a relaxed attitude, but are still sharp and attentive. Despite having 319 rooms, Van Zandt has a boutique hotel feel whilst still delivering big-brand name finesse and consistency. You can crash or chill, and in Austin you really need the option to do both. ACCOMODATION CATEGORY: Plush hotel with personality. POOL/GYM/SPA: Rooftop pool and Gym. FEEL: Rock & Roll meets Urban Sanctuary. RATES: Starting at $150 AUD p/n. LOCATION: Downtown Austin, Rainey Street district. GOOD TO KNOW: There's wine hour every evening at the hotel. The writer was a guest of Texas Tourism and Hotel Van Zandt.